Get 10% discount for services, between 8 am - 10:30 am (by appointment only) & 10:30 am - 2 pm. Warmed glass is used to suction out toxins or what they call in Tagalog "lamig" and helps in improving blood circulation. 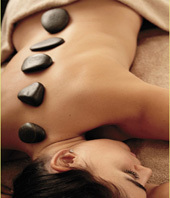 Specially selected heat stones are used to massage the body, providing a nurturing & enhanced therapeutic effect. The application of heat not only increaes the feeling of well-being but also enables the therapist to work more deeply and effectively with chronic pain conditions. Also known as ear coning, is a simple, effective method for removing ear wax build-up, fungus and impaction from within the ear canal.